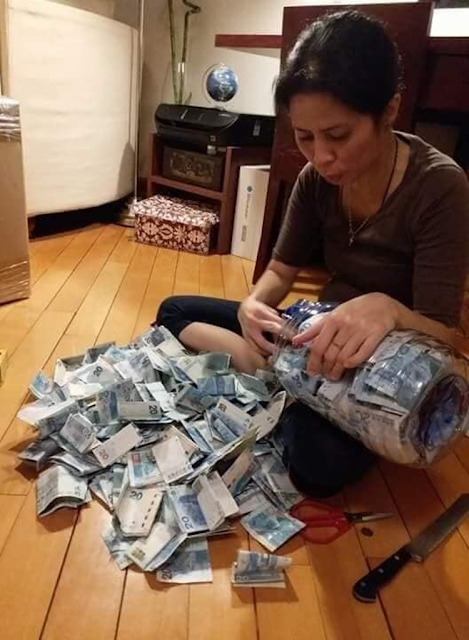 An Ilongga OFW in Hong Kong went viral for doing the "Ipon Challenge," it's really inspiring. Jalyn Navio, 39 successfully saved $21,760 or Php 140,000 pesos in six months, according to the post of Facebook user Jennifer Paloma Debaja. Navio is a nursing graduate was inspired to save money after attending the Financial Literacy Seminar of CARD Hong Kong Foundation. Navio has a Php 54,000 or HK$ 8,200 monthly salary and she discipline herself to save every month while sending P 10,000 every month for her relatives's educational allowance. She placed her monthly savings to a plastic bottle which turned out a success. The Ilongga OFW started to work in Hong Kong in 2002. The post described Navio as a carefree woman, fond of shopping and loves to treat friends. However, at some point in her life realization comes to open her mind of saving money for her future. Little did she know, out of her self discipline and by applying those what she learned from financial literacy, she made to save money and inspires her story to others.